In honor of Independence Day, this week’s Meatless Monday has been preempted in favor of Red, White, & Blue! I bought a bag of specialty potatoes several weeks ago. They’re tiny little guys, sort of a cross between fingerlings and new potatoes, and came in the three colors above. I could almost hear the Star Spangled Banner playing in my head as I set to concoct a simple recipe that would showcase their beautiful colors. And here you have it. 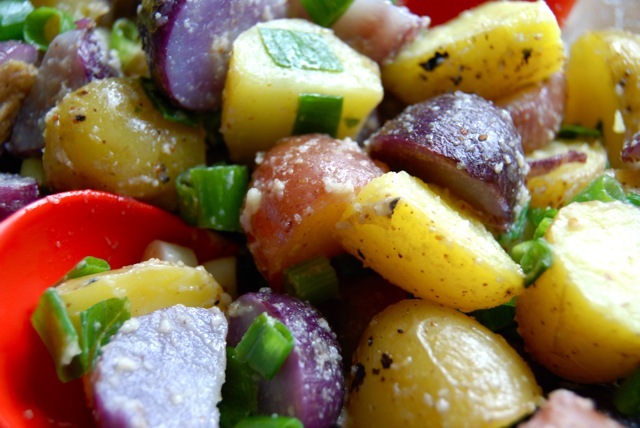 A low-sodium potato salad with such fabulous flavor you won’t believe it’s salt free! BONUS? Since it contains no mayonnaise, you can leave it outside on the picnic table and not worry about sending your friends and family to hospital with food poisoning! HOORAY! 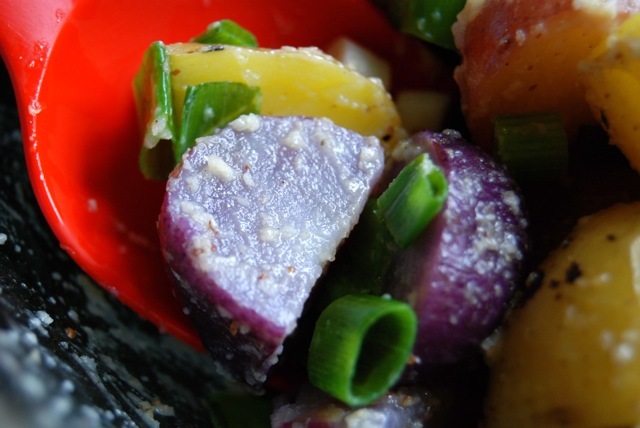 If you can’t find smaller size multicolored potatoes, don’t worry. Just use what you have. Depending upon the size of the potatoes, you may need to steam them a bit longer. Keep watch and as the minutes pass, test them by piercing gently with a fork. 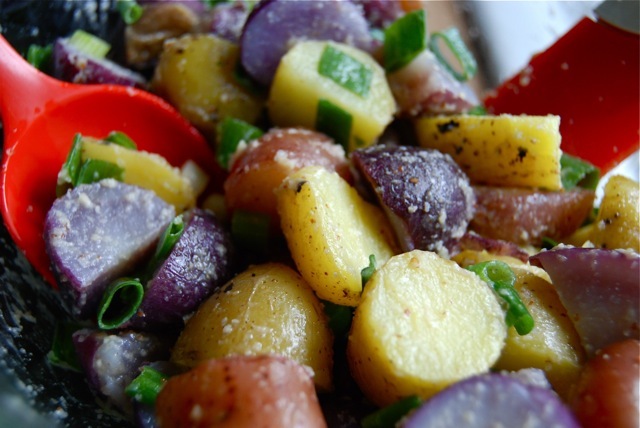 You want the potatoes to be tender, yet not so soft they fall apart when tossed with the dressing. If you don’t have a fancy steamer, don’t sweat that either. A pasta pot with a colander type insert works perfectly. And if you’re exceptionally patriotic, feel free to stick little American flags all over the potatoes. Happy Fourth of July, my friends!! Let the barbecuing begin! Get out a steamer pot. Scrub potatoes and place into the steamer basket. Set aside. Add a few inches of water to the pot, place over high heat, and bring to a boil. Once boiling, insert steamer basket, cover, and steam 10-15 minutes (depending upon the size of the potatoes). Once tender, remove pot from heat. Carefully remove potatoes from steamer and set aside briefly to cool. Cut potatoes into bite-sized chunks and place into a bowl. Add the scallions and set aside. Place the remaining ingredients into a blender or food processor and pulse well to combine. Pour dressing over the salad and toss gently to coat. Serve immediately or cover and refrigerate until serving. This entry was posted in Salads and Dressings and tagged Fourth of July, low sodium picnic fare, low sodium salads. Bookmark the permalink. I love this kind of potato salad. It’s very similar to a family recipe for Greek potato salad. It’s just chunked up potatoes with an olive oil & lemon dressing and lots of chopped parsley & red onion. It’s a family favorite. The recipe makes a lot, but there are never any leftovers. Shambo, that Greek version sounds SO GOOD! Going to try it next with lemon and parsley. And some sliced garlic scapes. And maybe some fresh white onions. with greens. And….. MMMMMMMM!! Hope you had a wonderful 4th, my friend!